WACO – Baylor Softball’s run at the Women’s College World Series ended Sunday, but Tuesday night after Florida won the national championship with a two-game sweep of Alabama, two Lady Bears were elected to the WCWS All-Tournament team. Baylor junior shortstop Jordan Strickland, who led the entire tournament with six RBI, was named to the WCWS All-Tournament team while sophomore leftfielder Linsey Hays earned the all-tournament nod as well. “The greatest players thrive on the biggest stages. Jordan and Linsey love the highest level of competition, it challenges them and I’m happy that they were rewarded with this recognition,” said Baylor head coach Glenn Moore. Strickland hit .455 (5-for-11) with five runs scored, and she tied for the WCWS lead with six RBI (Stephanie Tofft). 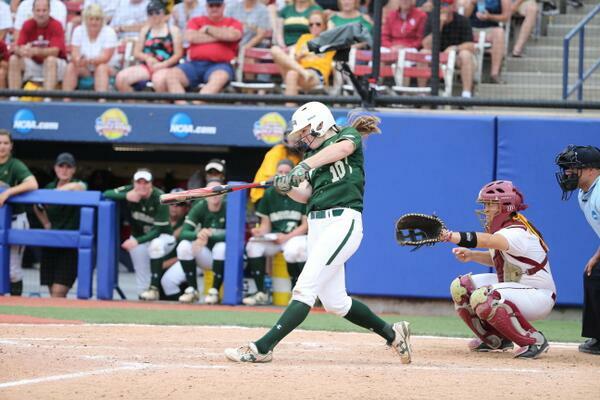 Her key performance came in Baylor’s 7-2 win over Florida State Saturday where she became just the 13th player in WCWS history to hit two home runs in one game. Strickland had a hit in all four of Baylor’s games in Oklahoma City. Hays hit 6-for-12 at the plate with a .500 batting average, scored four runs and drove in a run. Her key game was also the FSU contest where she tied a Baylor postseason single-game record with three runs scored and tied a BU WCWS single-game record with three hits. Hays also scored a run and drove in a run in Baylor’s 8-7 win over Kentucky Saturday. Baylor achieved the largest comeback in WCWS history Saturday night against Kentucky, after trailing 7-0, the Lady Bears scored eight runs in the final three innings to eliminate the Wildcats. The Lady Bears’ 2-2 record at the 2014 WCWS helped them advance to the semi-finals for the second time in four seasons. Baylor finished second at the WCWS with a .274 team batting average.